Here is the interview of Rahul Dravid after he scored his 33rd century at Lord's. Rahul Dravid, a few months older than fellow 38-year-old Tendulkar, is an undeniably great batsman in his own right with more than 12,000 Test runs at an average in excess of 52. His latest century was his 33rd in 154 Tests yet the focus remains on Tendulkar, who had been an international player for some seven years by the time Dravid had made his debut. 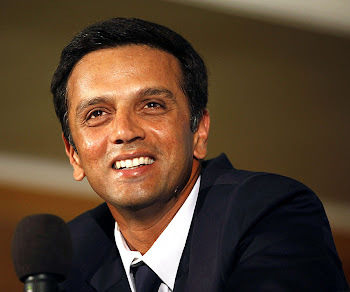 "The talk is always about Sachin and rightly so," said Dravid. "He is a true legend of the game. To be on 99 hundreds ... it was set up for him. It suits me, I suppose. I can slip by quietly, do my job and get on with my business." Dravid was proud of scoring a Test century at Lord's - an achievement that has so far proved beyond Tendulkar, Australia's Ricky Ponting and the now retired Brian Lara. "To miss out in my first Test here was something that stayed with me a little bit," he said. "It's not that if I hadn't got this hundred it would be the end of the world. There are lots of grounds where I haven't got a hundred. "But it was there in the back of my mind that I probably had one more go at it. For it to come in this situation feels really good. There are some great names on that honours board and it's just nice to be on it." India have lost just one Test when Dravid has scored a century and he said: "Hopefully that's a good omen and we can fight back."